The PSA test has been dissed a lot lately. The nation's preventive medicine task force, for one, says the test is so unreliable in figuring out who's at risk for deadly prostate cancer that most men shouldn't bother getting one. But the test for prostate-specific antigen, imperfect though it is, remains one of two main tests for prostate cancer, along with the digital rectal exam. So for many men it's hard to resist getting a PSA measurement, even though testing can lead to unnecessary surgery and to nasty side effects like incontinence and impotence. In a perfect world, doctors would sit down with men and have a thoughtful discussion about the pluses and minuses of the PSA test. The patient would explain his worries and health issues. Then the doctor would take those into account and suggest personalized options, including doing nothing. But those discussions aren't happening, according to two studies and a survey. That process, called shared decision-making, aims to give the patient a chance to learn about the options available and what good or bad could come of them. Then he could decide which options best suit his needs. Shared decision-making for prostate cancer testing was endorsed earlier this year by the American Urological Association. But most doctors never ask, according to a survey of more than 3,000 men ages 50 to 74. Almost two-thirds said they'd never had a discussion with a doctor on the advantages, disadvantages, and scientific uncertainty surrounding the PSA test. More educated men who get screened more often were more likely to have had the chat. The survey, which was led by researchers at the Maine Medical Center Research Institute, was reported in Annals of Family Medicine. Two other studies in the same issue of the journal looked at whether it's possible to train doctors to get better at this. The verdict? Well, maybe. In the first study, half of a group of 120 physicians were given training in using shared decision making to discuss the PSA test. After that, the doctors had visits from actors posing as patients, who were trained to ask if the doctor thought they should get a PSA test. The trained doctors were slightly more likely to use shared decision-making skills when talking to the patients, and were more apt to say that not getting screened was an option. 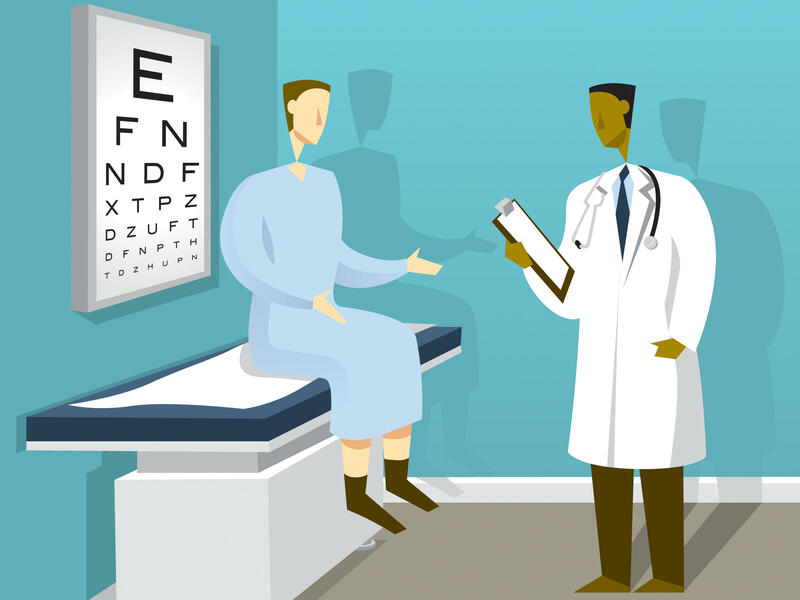 In the second study, doctors were given another form of training on talking to patients about prostate cancer screening, and some of those doctors were prompted by patients to talk about it. Despite all that, the patients reported no differences in shared decision making between the trained doctors and untrained controls. But the trained doctors who were prompted by the patients were perceived as more neutral, and more likely to bring up prostate cancer screening. Both studies were conducted by researchers at the University of California, Davis, School of Medicine. Results of a new study of nearly six thousand men with prostate cancer indicate those treated either with surgery or radiation could benefit from taking aspirin regularly. In a KERA Health Checkup, Sam Baker talks with Dr. Kevin Choe of U.T. Southwestern Medical Center about the study. There are few things less popular than a colonoscopy. So it comes as welcome news to many that a new blood test might be able to detect colon cancer before it develops.